First of all, I would like to thank you all for entering in the giveaway. I enjoyed reading all the comments. I had fun! Looking forward to the next giveaway coming up! Thanks for being such a gracious hostess! I will email you for details so I can get your prize out to you as soon as possible. Hi Christine-Thank you for contacting me by e-mail about winning the awesome versatile multi-pot. I can hardly wait to use it...have so many great ideas for it. Such a generous giveaway you are hosting,and if I seem to be repeating myself...well, It's True!!! 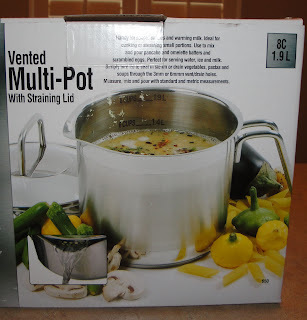 Hi Elisabeth, I know you will like the handy pot. Enjoy! Christine, That is very nice of you to do your giveaway!